When it comes to being invited on golf trips, there aren’t many places in the world that I think twice about. But I did hesitate for just a moment when Colombia come up. I’ve always wanted to go to South America, but this country in the continent’s far northwest hasn’t had the best of press in recent years. Things, though, have changed dramatically, and Colombia not only has that magical appeal of all Latin American countries, but it’s also blessed with over 50 golf courses. Let’s get our bearings first. Colombia’s densely forested and almost uninhabitable east is separated from its hot, wet western coastal plain by the Andes, which divide into three ranges with intervening valleys. Most of the population of 35 million live on the plains or cooler highlands. The country actually has two coastlines: one facing the Pacific Ocean and the other, the Caribbean Sea, with the Panama isthmus in between. Colombia has a long history going back well before the Spanish Conquest, and there are several sites that bear testimony to its fascinating Native Indian past. In San Agustín in the southern highlands, monoliths representing gods and warriors are preserved, and nearby Tierradentro boasts underground burial chambers open to tourists. From one of the bays of Tayrona National Park on the Caribbean coast you can climb foothills to the ruins of Pueblito, a settlement built by one of the most advanced cultures of pre-Hispanic America. Their use of gold for objects and artefacts helped create the myth of El Dorado that inspired the conquest of the entire continent. Cartagena de Indias, again on the Caribbean coast, was used as a base by the Spanish to store gold and other treasures accumulated throughout South America before shipment back to the mother country. Coveted and often assailed by English corsairs, the city became the best protected port on the continent, and the historical fortified centre has been preserved as a UNESCO World Heritage Site. Today the capital Bogotá, Medellîn (both inland on higher ground) and Cartagena are modern, dynamic cities with some great places to eat, drink and dance the night away. 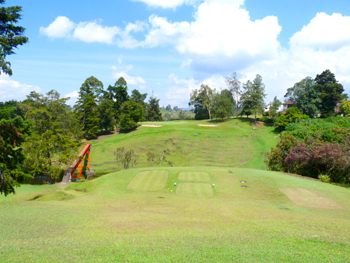 Throw in some excellent golf courses, especially in Bogota and Medellîn where the ball flies for what feels like miles because of the altitude, and you’re in for a lot of fun.